The first part of an extremely ambitious project, the book of days contains the first 116 of a projected 365 sonnets. The book of days aims to bring the sonnet, and the sonnet sequence into the 21st century. It is projected as the work of a lifetime. The form of the sonnets themselves is unusual: each comprises 14 lines of 10 syllables each, and without regular rhyme but with a regular tear in the ratio 7:3, into sections of 98 and 42 syllables. This enables the right hand poem to be read as a commentary, a summary or a separate poem. They are numbered chronologically in the order in which they were written, and as the sequence progresses the 15th sonnet, the ‘magistrale’, is composed from successive lines of the preceding 14. The 8 magistrales in this volume form the octave of a further, as yet unwritten poem. The first part of an extremely ambitious project, the book of days contains the first 116 of a projected 365 sonnets. 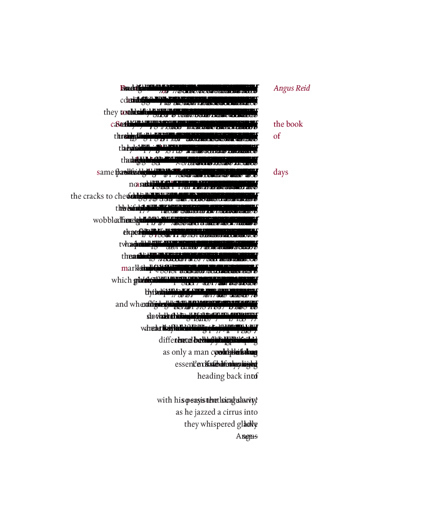 The book of days aims to bring the sonnet, and the sonnet sequence into the 21st century. It is projected as the work of a lifetime. The form of the sonnets themselves is unusual: each comprises 14 lines of 10 syllables each, and without regular rhyme but with a regular tear in the ratio 7:3, into sections of 98 and 42 syllables. This enables the right hand poem to be read as a commentary, a summary or a separate poem. They are numbered chronologically in the order in which they were written, and as the sequence progresses the 15th sonnet, the ‘magistrale’, is composed from successive lines of the preceding 14. The 8 magistrales in this volume form the octave of a further, as yet unwritten poem.